The Irish Lobby for Immigration Reform (ILIR) is calling all of Boston’s Irish community to come together Wednesday July 10th at St. Brendan’s Parish Hall, Dorchester. This public meeting will give supporters of the Immigration Reform Bill a chance to rally together to make real change and provide a path to citizenship for the thousands of undocumented people living in the U.S.
After last week’s passing of the Immigration Reform Bill through the U.S. senate, the debate now moves to the House of Representatives. Wednesday night’s meeting in St Brendan’s is part of ILIR’s plan of attack in lobbying members of congress to vote in favor of the Reform Bill; a collective effort to make the Bill successful. ILIR President Ciaran Staunton will be present at the meeting in Dorchester, as will ILIR co-founder Niall O’Dowd. With reform now a real possibility, the organization is leading a coordinated effort to get the public to contact their local representatives and urge them to vote in favor of the bill. The Immigration Bill includes two provisions which have major significance to the Irish; 1) a path to legalization for the undocumented Irish and 2) possibility of 10,500 renewable E-3 visas on an annual basis for people in Ireland. “We do not intend the Irish to get left out on the cutting room floor again,” says Staunton. “This bill provides for the first time in years a real chance for the Irish undocumented to come out of the shadows and have a better way of life. What is needed now is for everybody both in Ireland and the US to use their contacts and get backing from the House for this Bill." This is a rare opportunity to make a real change to the immigration laws and should not be missed by anyone who wants the Reform Bill to become a reality. The meeting will take place on Wednesday, July 10 at 7:30 PM in St Brendan’s Parish Hall, 589 Gallivan Blvd, Dorchester. 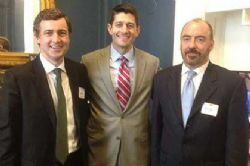 For more info visit www.IrishLobbyUSA.org.